You can also just see the edge of Valerie Glacier, and the medial moraine the separates the 2 glaciers, on the left hand side of this frame. The 2 iceflows join up a few miles before they calve into the Bay, and together form an open glacial face that’s over 6 miles wide. Impressive stats, for sure. Other points of interest include Gilbert Point, the small channel on the right hand side of the frame here, through which the Russell Fjord drains into Disenchantment Bay. 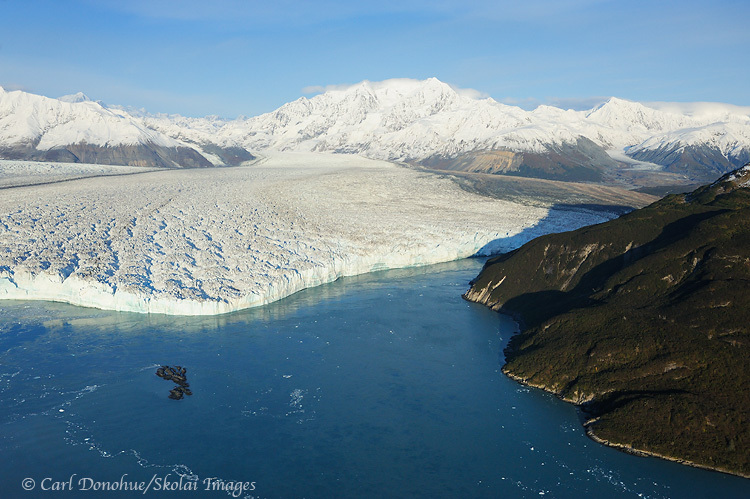 The Glacier advances every summer, often at a relatively rapid rate, and has twice recently plugged Gilbert Point, threatening to landlock the Fjord, and potentially flood surrounding ecosystems to the south. So far, though, that hasn’t happened, and each time the Fjord has forced its way thru the dam wall, breaking through the ice and emptying into the Bay; doing so very dramatically. In 1986 the flow was estimated to be over 5 cubic kilometres of water in 24 hrs, the 2nd largest glacial lake outburst flood ever; that’s about the equivalent of 35 Niagara Falls. How long this cat and mouse game will go on is anyone’s guess. Mt. Seattle stands aloft behind the Hubbard. The Hubbard Glacier actually starts at Mt. Walsh, to the north, but also a small tributary ice flow starts on the flanks of might Mt. Logan, Canada’s highest peak. 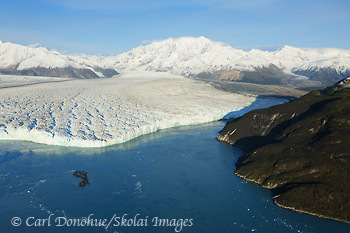 The Hubbard Glacier is also known as one of the most actively calving glaciers around. Here’s a couple of photos from a trip down there in 2008 of a calving face.